Jim Byrnes, a local resident explained the benefits of red wigglers to organic gardens. 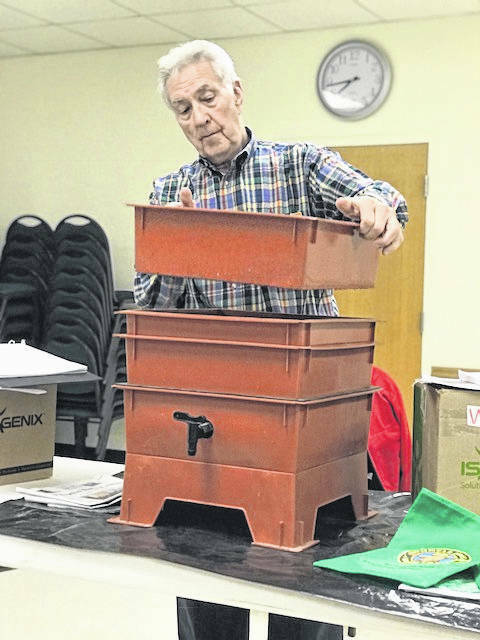 GALLIA COUNTY — Members of Four garden clubs in Gallia County were entertained and informed of the red wiggler worm and it’s successfully use in your vegetable or flower garden. Jim Byrnes, local resident who began developing warm beds recently, explained to the ladies present from Cheshire, Floral Friends, Gallipolis and Open Gate That with minimal care and feeding the red wigglers are beneficial to organic gardens. He said that they eat just about anything except citrus fruits. He showed the ladies present the box that he kept his in and explained how each layer of the box worked to make the worms bigger and to have the casting available for gardening. He gave each of the ladies present a cup of worms for their their gardens. Fortunately they were gummy worms. Dorothy Schumm, chair person, conducted the meeting with the devotions by Maxie Oliver, door prizes by the Open Gate Garden club and refreshments by Floral Friends Garden club. Gallipolis Garden Club was in charge of scheduling the speaker. Anyone interested in gardening or joining a garden club tonight is asked to contact Ms. Schumm and she assist with membership. Countywide meetings are held semi annually with the next meeting being in October.